One Sure Insurance has been providing our clients with Van insurance for over 10-years. Through the years, we have developed schemes whereby we can provide cover to clients who may have previous driving or criminal convictions. We know that mistakes can happen from time to time, and that's why our sales staff are able to provide bespoke and tailor made quotations for customers who have convictions either on their driving license, or on their personal record. Even if you've been turned down by other brokers and insurers, we are confident that we can help! ... and many more.. Just give us a call! 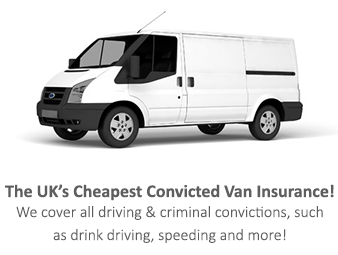 Our Van team knows the inner workings of each and every criminal and driving conviction, and we have access to bespoke specialist insurance schemes that our clients can benefit from. We are often able to price-match quotations, and provide further discounts to give our clients extremely competitive insurance coverage. We are so confident that we can provide affordable coverage to our clients that we offer an unbeatable special offer. If you take out an insurance policy with us, and manage to find a cheaper Van policy on a like-for-like basis, then we will give you a 100% refund providing you provide us with evidence within 48-hours. We're known in the insurance world as "Britain's cheapest, or your money back! ", and we stand by this motto. We cover the vast majority of driving license convictions, as well as criminal convictions, and are able to work directly with our insurance partners to establish preferential rates where other brokers may shy away from the risk.